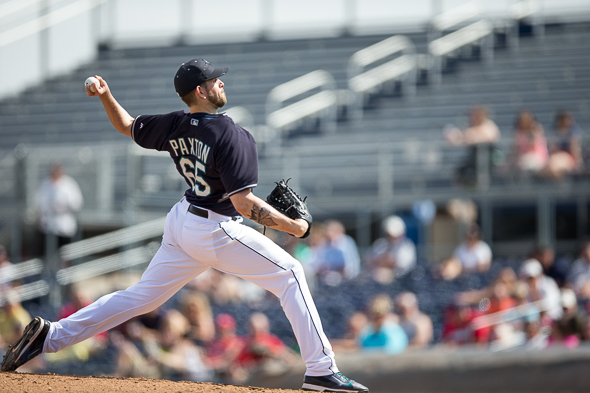 In James Paxton, the Mariners have a solution to their rotation woes — so long as the changes to his delivery hold up in his first full big-league season. There are three ways to view the Mariners starting rotation entering the 2014 regular season. In one camp are pessimists who think every pitcher behind ace Felix Hernandez is past his prime or too inexperienced to contribute at the big league level. In the other are optimists who think No. 2 starter Hisashi Iwakuma (strained finger tendon) and projected No. 3 Taijuan Walker (inflammation in throwing shoulder) will be healthy by the middle of April. They argue the Mariners can find one viable option out of the Zach Miner/Randy Wolf/Scott Baker/Erasmo Ramirez/Blake Beavan heap to fill the No. 5 spot in the starting rotation (assuming Iwakuma and Walker return when they’re expected). Then there is the camp that thinks Seattle will be somewhere between. Not as bad as the Joe Saunders/Aaron Harang/Jeremy Bonderman show of 2013, but not potent enough to exceed the 83-79 record projected by Fangraphs, an advanced statistics site heralded for its spot-on predictions. In 2013, Paxton impressed (3-0, 1.50 ERA) in four starts after making his major-league debut in early September. He’s done nothing to temper expectations in two spring training starts, yielding two hits and no runs in five innings. He’s the subject of a Monday feature in The News Tribune, which details how he turned around his pedestrian numbers in Triple-A Tacoma by shortening the back end of his delivery. According to Paxton, it alleviated his control problems, which were at least partly to blame for his 4.45 ERA while with the Rainiers. First-year pitching coach Rick Waits said the adjustment helped improve the timing of his delivery and made it more repeatable. That’s welcome news for a club that needs a lot of things to fall into place to challenge for the American League West title. Minus Walker and Iwakuma, the Mariners begin the season with 16 games against the Athletics, Rangers and Angels. When the rotation is healthy, Paxton figures to slide nicely into the No. 3 or No. 4 spot. But there’s no denying he has the repertoire of an ace. The average velocity of his fastball last season was 94.9 mph, according to FanGraphs. If he can supplement that with a major-league average curveball and a good change-up, Paxton will live up to his billing. Of course, those are big ifs, and given the Mariners’ awful luck with recent pitching prospects — Hultzen, Erasmo Ramirez and Brandon Maurer immediately come to mind — it’s natural to be skeptical. It’s also fair to be optimistic that Paxton has what it takes to be more than a capable option at the back-end of a big league starting rotation. Waits is also urging his pitchers to throw more inside, according to a story from 710 ESPN Seattle. Hernandez was roughed up in his latest start against the Rangers, but he didn’t seem too worried. After all, it’s spring training. ESPN baseball analyst Tim Kurkjian went on the radio and said that right fielder Corey Hart is has to be really good if the Mariners are going to win. Paxton should be at best the #4 starter but might start the season at #3 out of necessity. Not too thrilled at the prospect of more than one rookie in the starting rotation. That would put pressure on the bullpen and I don’t see the bullpen being as strong as last season’s and last season was inconsistent. If Paxton responds well to starting then there’s hope for a good year.